In March 2011 Forbes Magazine estimated his net worth to be $2.7 billion, with a $60 million salary. Trump was born in New York City in 1946, the son of real estate tycoon Fred Trump. Fred Trump’s business success not only provided Donald Trump with a posh youth of private schools and economic security but eventually blessed him with an inheritance worth an estimated $40 million to $200 million. It is critical to note, however, that his father’s success, which granted Donald Trump such a great advantage, was enabled and buffered by governmental financing programs. In 1934, while struggling during the Great Depression, financing from the Federal Housing Administration (FHA) allowed Fred Trump to revive his business and begin building a multitude of homes in Brooklyn, selling at $6,000 a piece. Furthermore, throughout World War II, Fred Trump constructed FHA-backed housing for US naval personnel near major shipyards along the East Coast. Trump eventually found himself in serious financial trouble. In 1990, due to excessive leveraging, The Trump Organization revealed that it was $5 billion in debt ($8.8 billion by some estimates), with $1 billion personally guaranteed by Trump himself. 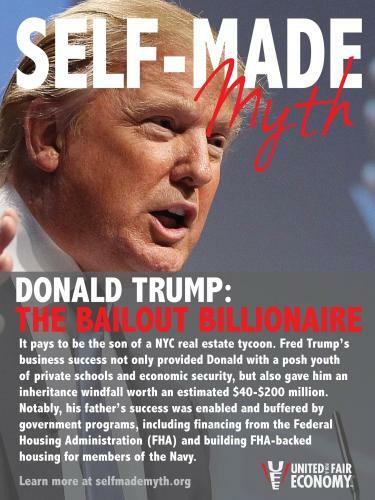 The survival of the company was made possible only by a bailout pact agreed upon in August of that same year by some 70 banks, allowing Trump to defer on nearly $1 billion in debt, as well as to take out second and third mortgages on almost all of his properties. 1. “Donald Trump Profile,” Forbes, May 2011, http://www.forbes.com/profile/ donald-trump (accessed October 28, 2011). 2. “The Trump Organization,” Funding Universe http://www.fundinguniverse .com/company-histories/The-Trump-Organization-Company-History.html (accessed October 28, 2011). 3. Robert Halasz and A. Woodward, “The Trump Organization,” CBS Interactive, http://findarticles.com/p/articles/mi_gx5202/is_1993/ai_n1912 2300/?tag=mantle_skin;content (accessed October 28, 2011). 4. Gwendolyn Parker, “George W. Bush’s Secret of Success,” New York Times, May 28, 1999. H. Ross Perot Sr. is best known as a candidate for president. In his 1992 campaign, he ran as an independent, using $65.4 million of his own money, and won 19 percent of the vote. Though his political moment may have passed, he remains an economic powerhouse in America to this day. As of this writing, the 81-year-old Perot is one of the 100 richest individuals in the United States, with an estimated net worth of $3.4 billion. 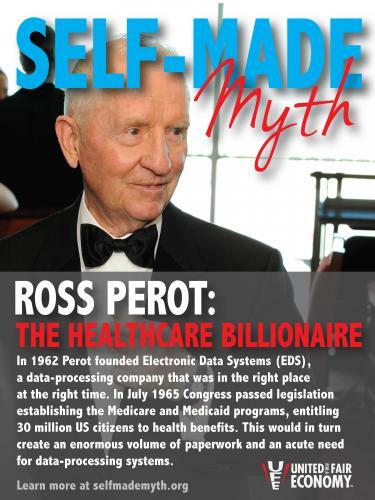 In 1962 Perot founded Electronic Data Systems (EDS), a one- man data-processing company that went on to employ more than 70,000 people. But EDS was a company that was in the right place at the right time—in July 1965 the US Congress passed legislation establishing the Medicare and Medicaid programs, entitling 30 million US citizens to health benefits. This would in turn create an enormous volume of paperwork and an acute need for data-processing systems. EDS moved into this enormous market, using its inside connection with Texas Blue Cross, the agency that would administer the federal program in Texas. Texas Blue Cross gave EDS its computer data business without any competitive bid. In its 1968 contract with Texas Blue Cross, EDS was paid $250,000 to develop a computer program to process Medicare claims. While government funds paid for research and development (R&D) of the system, EDS retained ownership of the program. Essentially, the R&D costs for EDS’s main product were paid for with tax dollars. In 1965, the first year of EDS’s government contracts, revenues were $865,000 and profits were $26,487. By 1968 EDS had revenues of $7.5 million, with profits of $2.4 million. Government analysts estimated that in its Texas Medicare work, profit margins were more than 100 percent. At their peak in 1970, EDS shares traded at $162.50, putting Perot’s personal net worth at more than $1.5 billion. In 1984 Perot sold EDS to General Motors for $2.55 billion. Initially, Perot retained a large ownership interest in the company and a board seat at General Motors, but in 1986 GM bought out Perot’s remaining stock for $700 million. Once established as one of the wealthiest men in the United States, Perot was easily able to stay on top. In 1988 he founded another information technology company, Perot Systems, which he later sold to Dell for $3.9 billion in 2009, pocketing approximately $380 million for himself. 1. “The Political Fray,” CNN All Politics, 1996, http://www.cnn.com/ALL POLITICS/1996/conventions/long.beach/perot/political.fray.shtml (accessed October 28, 2011). 2. “Henry Ross Perot,” Forbes, March 2011,http://www.forbes.com/profile/henry -ross-perot-sr (accessed October 28, 2011). 3. GeraldPosner,CitizenPerot:HisLifeandTimes(NewYork:RandomHouse, 1996), pages 35-47. 4. Doron P. Levin, “G.M. vs. Ross Perot: Breaking Up Is Hard to Do,” New York Times Magazine, March 26, 1989 (accessed October 28, 2011). As with most family fortunes, the Koch brothers’ money can be ascribed to many sources beyond their talents and hard work. Start with $300 million—as Charles and David Koch did when their father, the founder of what would become Koch Industries, died in 1967. Before that, of course, the sons benefited from an upbringing that featured large homes, overseas travel, and the finest education at private schools, including Massachusetts Institute of Technology, their father’s alma mater. 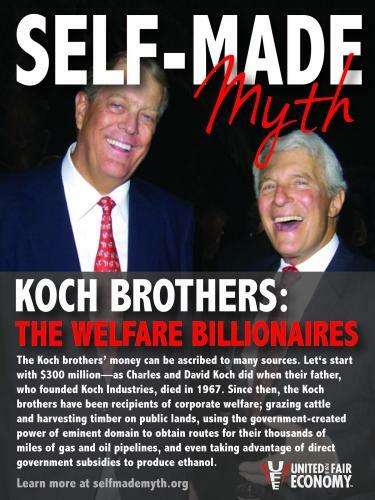 Despite spending hundreds of millions of dollars over the years, demonizing government and promoting pure free-market capitalism, the Koch brothers have been unashamed recipients of corporate welfare. They graze cattle and harvest timber on public lands, reaping the profits while paying minuscule fees. They use the government’s power of eminent domain to obtain routes for their thousands of miles of gas and oil pipelines. They even take advantage of direct government subsidies to produce ethanol. 1. Jane Mayer, “Covert Operations: The Billionaire Brothers Who Are Waging a War against Obama,” The New Yorker, August 30, 2010 (accessed October 28, 2011). 2. Yasha Levine, “7 Ways the Koch Bros. Benefit from Corporate Welfare,” The Exiled Online, September 4, 2010, (accessed October 28, 2011). Why do we Coddle the Super-Wealthy?